On its website, Noctua says it is a “collaboration” between Austrian and Taiwanese companies. They are famous for premium products, products that cool well and quietly. To that end, the word Noctua means owl, a bird that flies on silent wings. The NH-U14S is a single tower design that is symmetrical front and back. It is thin enough that it avoids interfering with any tall RAM you may be using, even if you use an LGA 2066 or 2011 motherboard. The heatsink has six heat pipes and includes a single 1500 RPM NF-A15 PWM fan and includes hardware to fit a second 140 mm fan (sold separately). 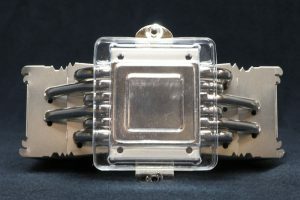 Their SecuFirm2 mounting system. 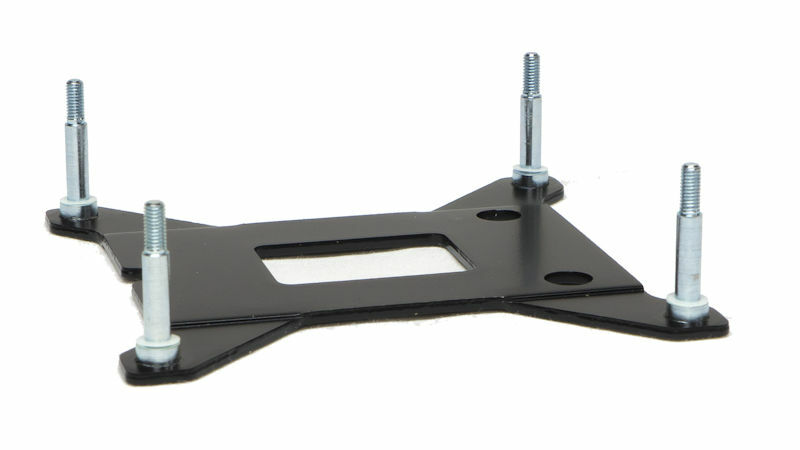 Except for the final brackets, this is the same mounting kit used on all of their coolers. Noctua does make a NH-U14S TR4-SP3 version of this heatsink, aimed at the Ryzen Threadripper / Epyc platform. They note “the NH-U14S TR4-SP3 is a dedicated version for the AMD TR4/SP3 socket. 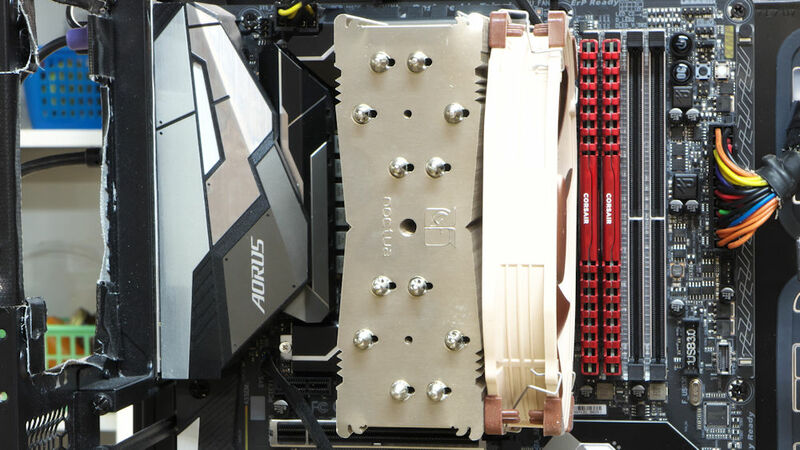 Due to its customized larger base, it cannot be used on any other sockets and is incompatible with Noctua’s standard mounting kits.” The version we are seeing reviewed has hardware for Intel and earlier AMD sockets. 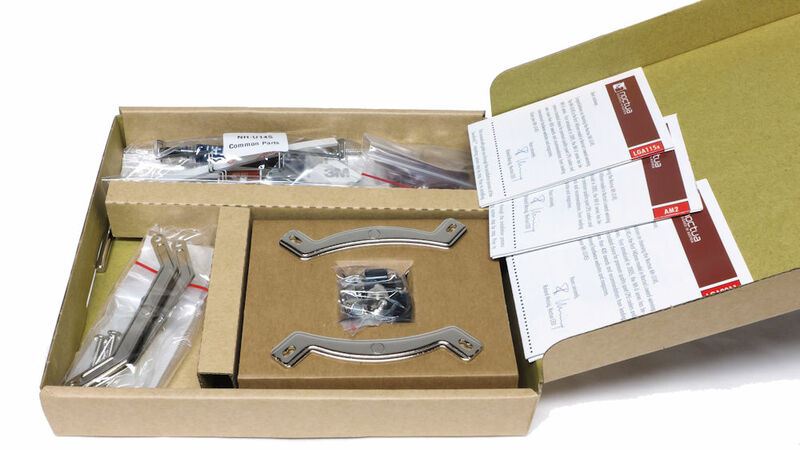 The heatsink comes in a simple box with black and brown ink extolling the virtues of the enclosed heatsink. When we open the box we see the accessories box on top. You will note no plastic or Styrofoam – it is all recyclable cardboard. Underneath the accessories box sits the heatsink itself. It sets with the attached fan and is immobilized/protected by its own cardboard box with the heatsink resting on a tray. Basically, the entire assembly is shielded by cardboard corners. Finally, we have the tower standing by itself. 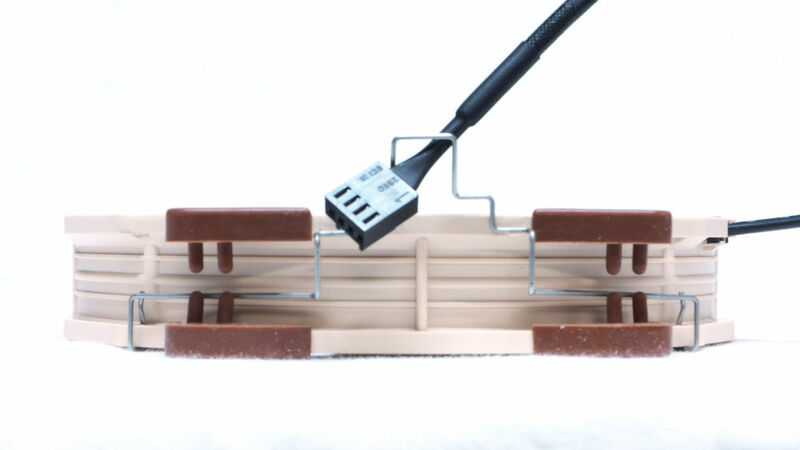 Notice how thin it is – just wide enough to enclose those six 6 mm heat pipes. In the first photo, we see the NF-A15 PWM fan. There is no doubt it’s a Noctua given its unique coloring. 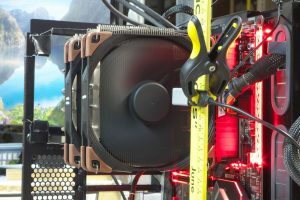 It’s equipped with anti-vibration padding and two clips for securing the fan to the tower of the cooler. In the second picture, we see the accessories box. Nearest to us, on the left, there are AMD (pre-Ryzen) mounting brackets, you’ll also notice the end of the L-shaped Phillips screwdriver that is included in the heatsink kit. Next to them are the Intel platform brackets including a bag of cap nuts and spacers nestled into the center and underneath. In back, you can see common parts including thermal paste, spare fan clips and the extra-thick cushions for the fan. Finally, the folded manuals are displayed on the lid. PDF copies of the manuals are available online here. The left picture shows the base of this heatsink with the plastic contact plate shield here. On the next picture, we are not able to notice distortion here – the surface is nearly flat and has a mirror finish. Pay attention to that hold down screw. The bottoms have a positive stop against the brackets then the springs hold the heatsink down. Taken together the springs and hold down screws assure the NH-U14S cannot exert excessive clamping pressure. 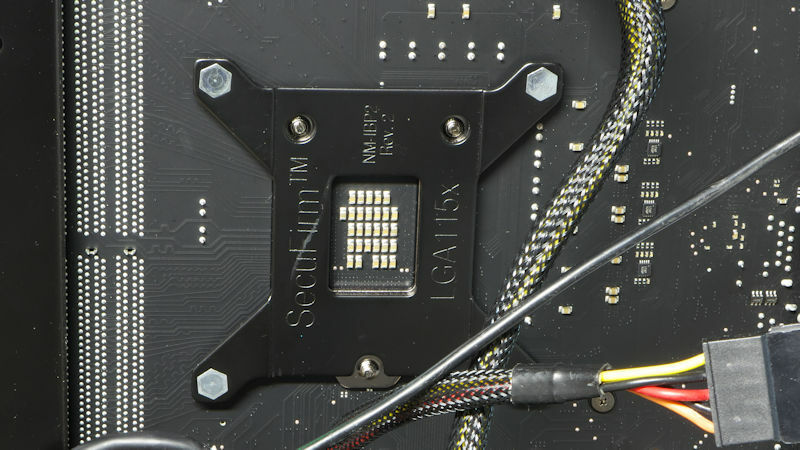 There is one thing you must pay attention to: those screw heads on the back of the Intel socket are not symmetrical. 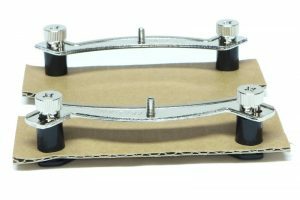 This makes the orientation of the backplate a critical matter. You want those three screw-heads showing through the holes in the backplate. If you don’t pay attention you can fit the backplate incorrectly and cover those srew heads. So get it right. On the right is a picture of the backplate by itself. The screws you are essentially studs and press-fitted to the backplate. 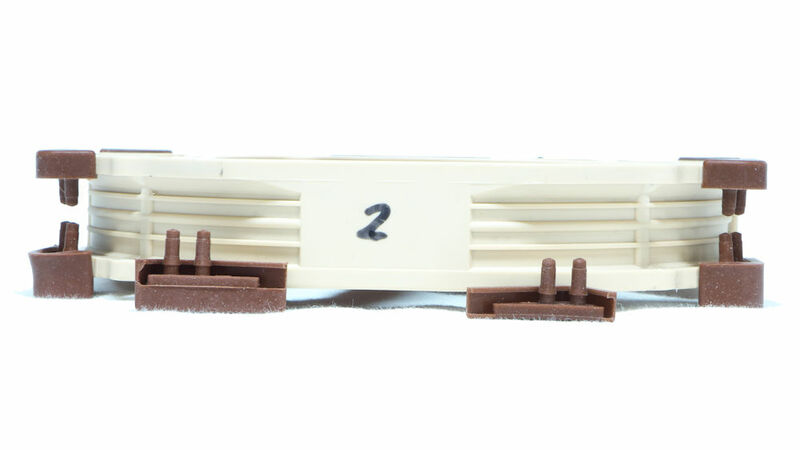 This is an improvement over the early Noctua backplates as the screws were separate back then. 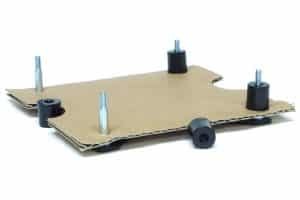 A piece of cardboard stands in for a motherboard so you can see how this mounting system works. 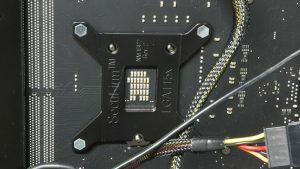 Spacers go on top of the through-motherboard screws. In the next image, you see the mounting brackets set atop the spacers, held in place with cap nuts. The cap nuts can be tightened with fingers or a Phillips screwdriver. We put the heatsink on the Noctua mount. 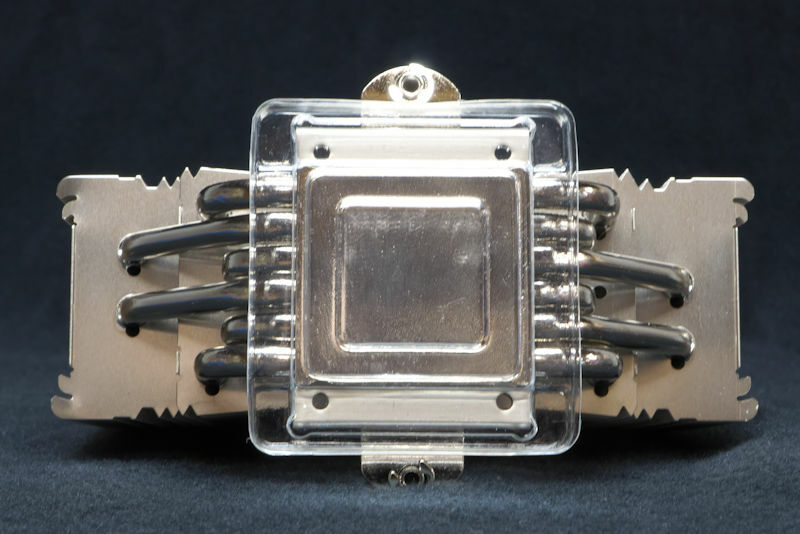 Note that the crossbar is held to the heatsink with a screw. That saves you from dealing with a loose crossbar. Next we can mount the fan and the assembly is complete. 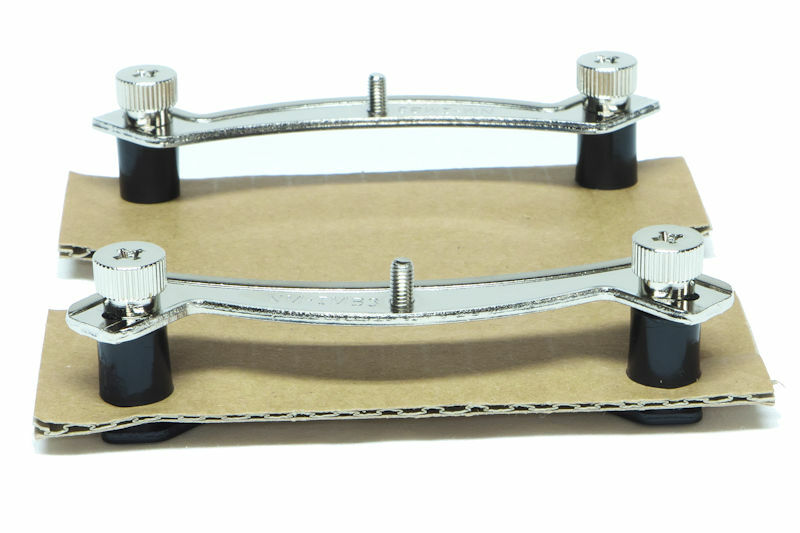 In the picture, the fan is elevated by the extra-thick anti-vibration pads attached to it. One has been left free to show the difference in thickness between it and a standard-thickness anti-vibration pad lying next to it in front of the fan. Something else to notice: the fingers attaching the pads to the fan has collars to catch the flange. You will need to tug on each finger as it penetrates the flange to make sure it seats properly. Putting it all together we see the thicker trailing pads held together with a second pair of fan clips (you will find a pair in the accessories box). Finally, the NH-U14S sitting on a motherboard. This overhead view shows that the heatsink does not interfere with RAM. Further, it shows the hexagonal distribution of those six heat pipes. Last it shows the screwdriver access hole in the center of the tower. With the current review, we are inaugurating a new system for testing the capacity of heatsinks to cool your chip. We are using the six-core Coffee Lake CPU, the i7 8700K, overclocked to 5.0 GHz. 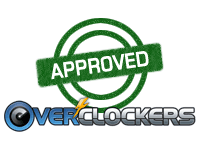 The overclock chosen for this series was 5 GHz which equates to the CPU using around 145W. This is at the upper end of what heatsinks can cool but this particular range was chosen so that AIO’s will be tested fairly in later reviews. The Vcore was set manually to a static mode (not adaptive mode) for testing consistency. After each heatsink was mounted the temps were not measured for a day to give the TIM time to spread and thin out. The sound pressure level was recorded a meter away at a position “above” each heatsink in decibels with an A-weighting (dBA). While SPL is at best an approximate measure of what we hear, it is all we have. The SPL ratings you will see are SPL above what sounds like a silent basement. 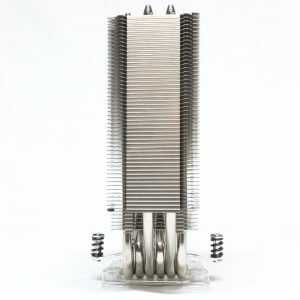 Megahalems: When this heatsink came out in late 2008 it was the heatsink to beat. It appears to be unique as it has two towers, but side by side, rather than in tandem. When there are push-pull fans and the fans set up enough airflow the gap between the towers has always produced a moaning sound. In this picture, there are two, sleeve bearing, 140 mm Blue Vortex fans. The little rectangular object clamped to the yardstick is the Digital TEMPer USB Thermometer. 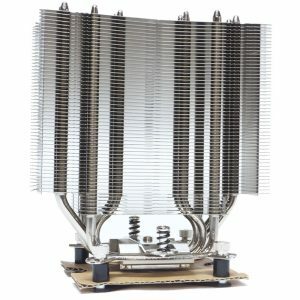 Genesis: Also from Prolimatech, this heatsink is unique in that one of its towers is parallel to the motherboard. 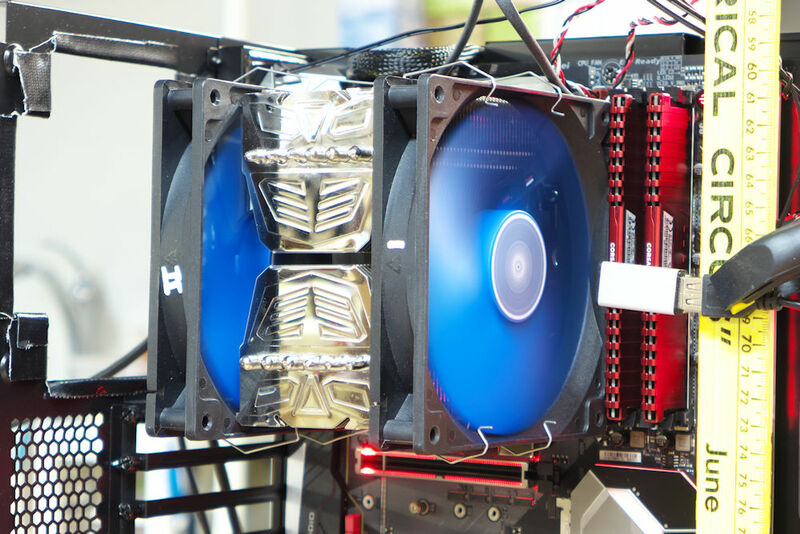 In the picture, it is sporting the same Blue Vortex fans. 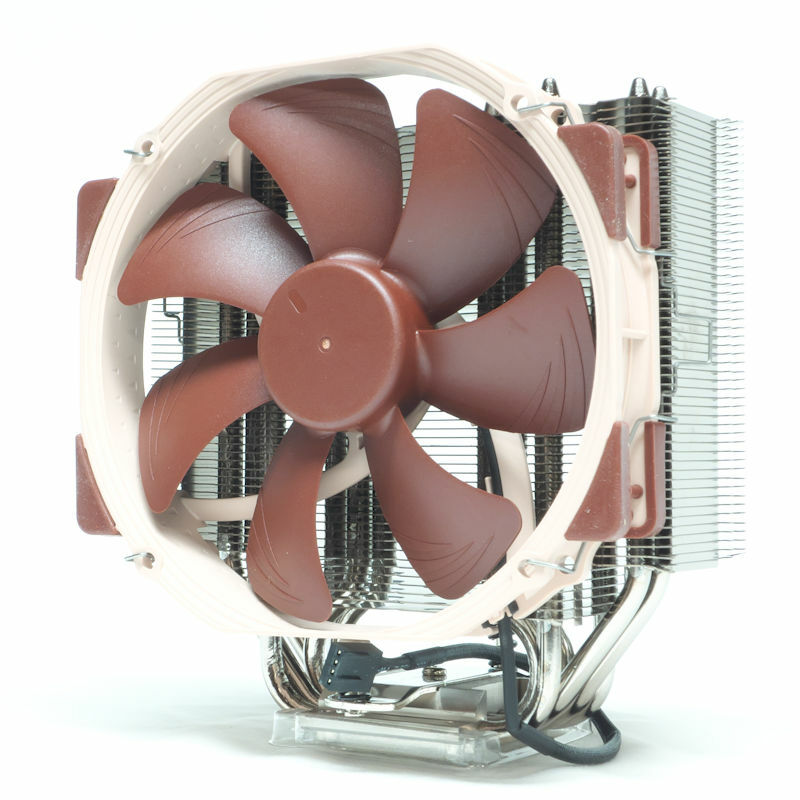 With both Prolimatech heatsinks the procedure is to use Gelid GC-Extreme TIM. On the left is an NH-D14 with its original fans. 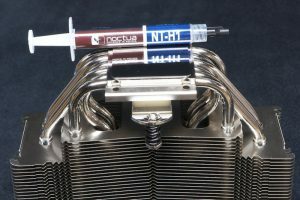 This heatsink is officially EOL but Noctua continues to make them because people continue to buy them. 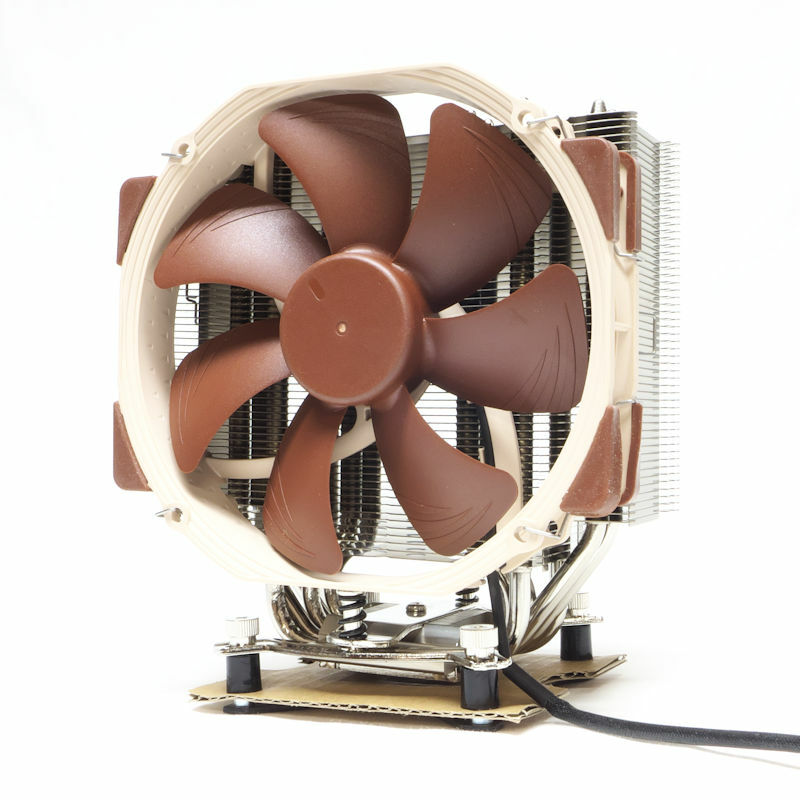 With all Noctua heatsinks NT-H1 TIM was used. On the right is the same heatsink with three NF-A15 1200 RPM fans. Here you can see the utility of a low profile RAM. Given that DDR4 RAM runs 1.2-1.35 volts there is no reason to get tall RAM. 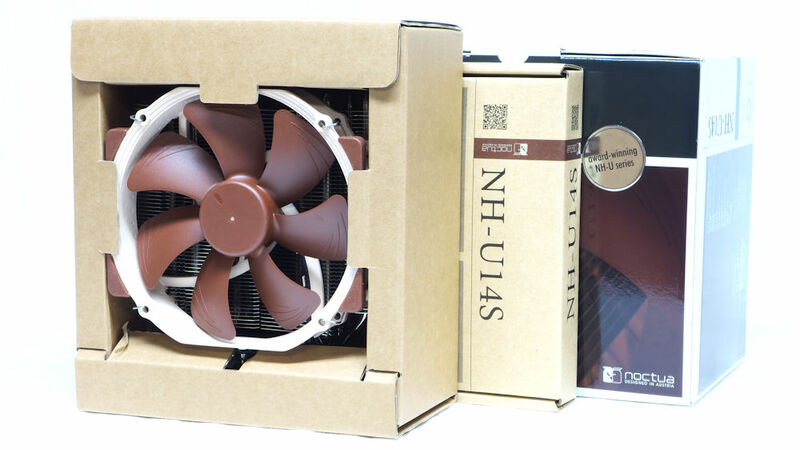 Here is a Noctua NH-D15 with its stock NF-A15 1500 RPM fans. Like all the heatsinks, it has six heat pipes. Note that the NF-A15 fans stretch across the full width of the NH-D15’s twin towers. The last arrangement is the NH-D15 with two, 2000 RPM NF-A14 fans. The squareness of the fans is clearly delineated here. They do not reach across the full width of the towers. The Prolimatech heatsinks and the NH-D14 were purchased. 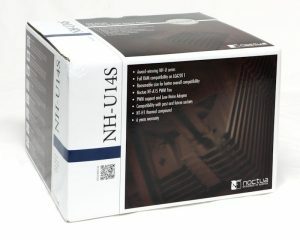 Noctua provided the NH-D15 and the NF-A15 PWM fans. Noctua also provided the NH-U14S featured in this review. A big thank-you goes out to them. All of the contestant heatsinks were facing power reported to be in the 145-watt range. They all did pretty well, even the ones at the bottom of the stack. It should come as no surprise that in this cool-off (or should we call this a bake-off?) the NH-D15 took the top five, the coolest combinations. The top spot goes to the D15 sporting a train of stock A15 1500 RPM fans that were slowed by their included Low Noise Adapters. 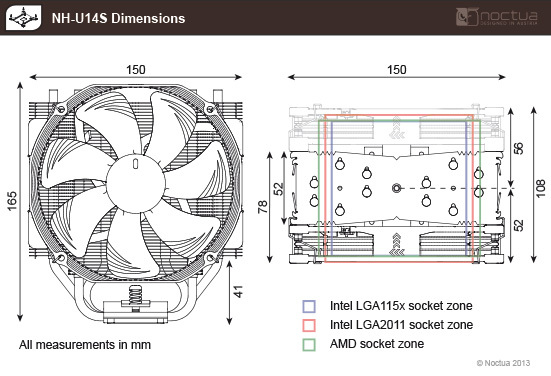 It also included an additional retail A15 (1200 RPM) for a total of three fans. 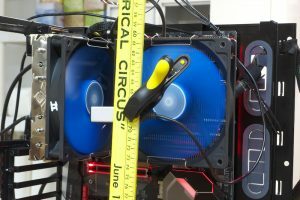 These three slower fans made an SPL that was quieter than the stock setup. 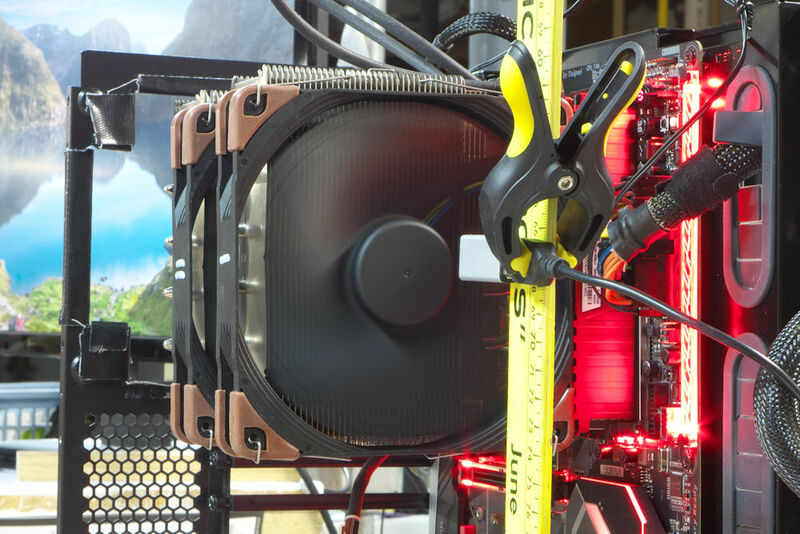 Based on what we later learned, probably by putting the fastest fan first, you might squeeze out another few tenths of a degree from your system. The stock setup of the NH-D15 is only 0.6 °C warmer than the leader. By putting LNA’s on the two fans only produced a loss of 0.2 °C, the system was barely warmer, but the heatsink was nearly inaudible. Finally, the NH-D15S comes with a single fan. Pretending it was a D15S the D15 still bested the other heatsinks, and with only a single fan. 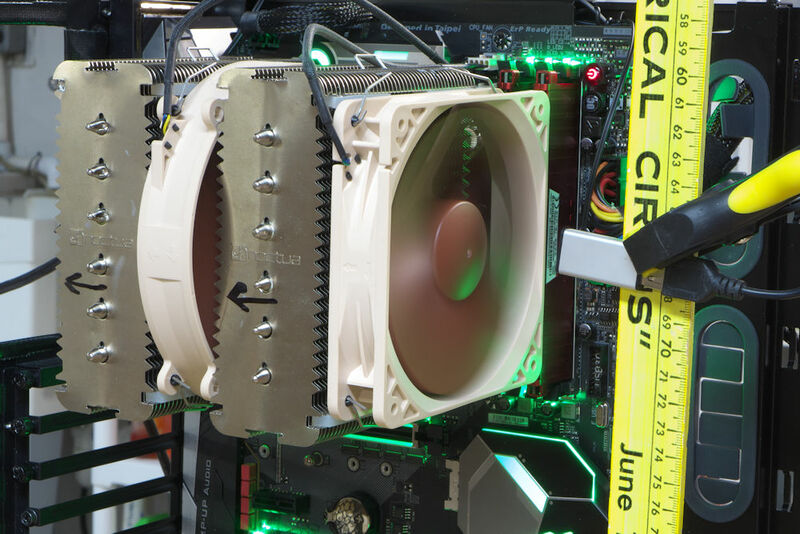 The NH-D14 with an all-new suite of three A15 PWM fans was trailing right behind the NH-U14S at 62 °C. Then we see the Prolimatech heatsinks. The one disappointment comes when the NF-A14 2000 RPM fans are put on heatsinks. For some reason, they do not do as well as you might expect (partly because they were square, partly because they could not use spacers?). 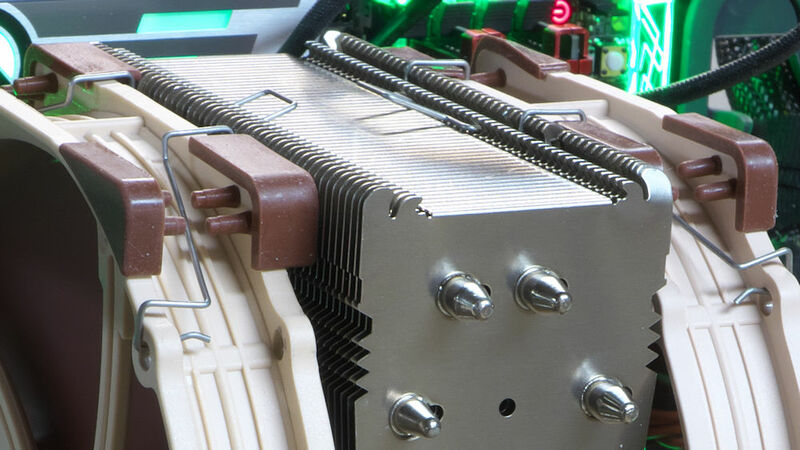 A comment one might expect is that there is not much separation between the heatsinks. That was the purpose of doing three runs with each heatsink: the results are consistent. The Megahalems and the Genesis ended up on the bottom of the stack of results. But remember there is only a 4.4 °C difference between the best and the worst results here. What is surprising is that the U14S finished as high as the middle of the pack. 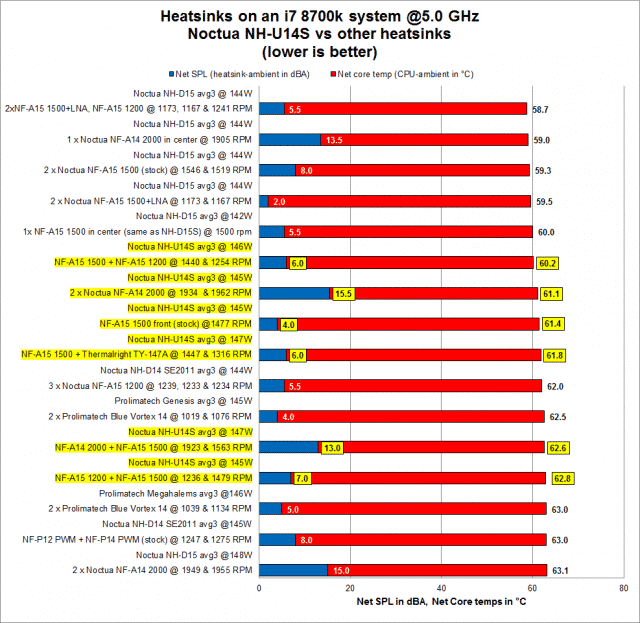 How can you expect a single-tower heatsink to keep up with dual-tower competitors, especially doing Linpack with AVX2 at 5 GHz? First, the double-fan setup (1500 as push, 1200 as pull) finished only 1.5 °C behind the leading D15 combination. This is an amazing result. Even stock it only runs 2.7 °C behind the leader. Going with a TY-147A seems a like a good idea. 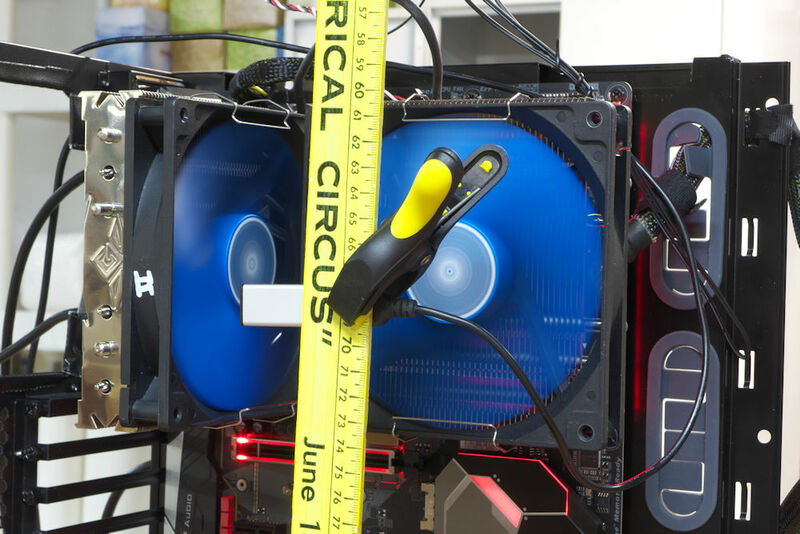 After all, it is a 160 x 140 mm PWM fan that runs a little faster than an A15 and is inexpensive. But the two-fan combo ran 0.4 °C behind the stock single-fan option, and 1.6 °C warmer than the best U14S combination. This raises the intriguing question as to whether the “spacer” pads improve a trailing fan’s performance. We could test the same fan combo without those extra-thick pads, but we must stop the testing somewhere. 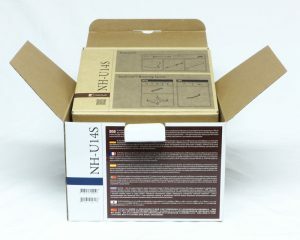 The Noctua NH-U14S is available from Amazon at $63.75, and available from Newegg at $63.69. Versions for the new AMD CPU’s (Ryzen) are available at both places. The contestant heatsinks are making their first appearance in this system, so we are calibrating them for future reference. The Noctua NH-D15 still appears to be the best heatsink around. If you have a D15 you could squeeze another degree and a half, perhaps two degrees by adding a retail NF-A15 (1200 RPM) and cutting back the stock 1500 RPM A15’s by using their LNA adapters. Or you can rest assured that you have already bought the best heatsink and not spend another dime. 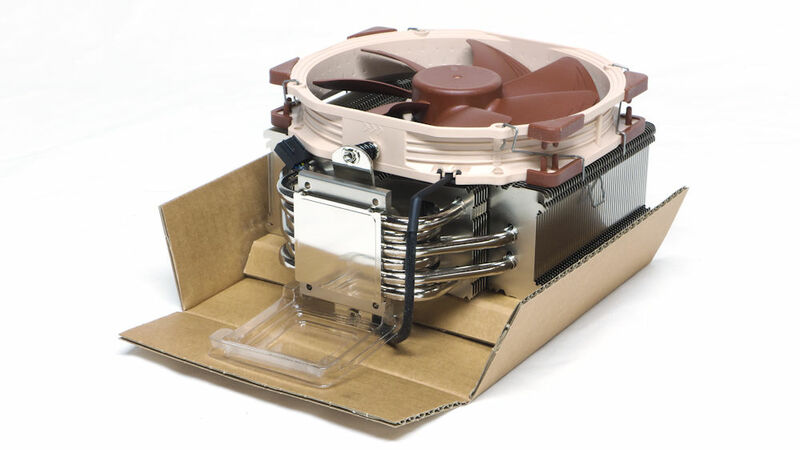 Noctua’s NH-D14 was a fine heatsink in its day. If you still use one, you can replace its fans with three retail NF-A15 PWM fans. Or you can leave it alone, spend no money and know you have an adequate heatsink. But if you have one of the early non-PWM NF-D14’s you may wish to change out your fans to get PWM technology and the quietness that comes with PWM control. The Prolimatech Megahalems and the Genesis heatsinks with the Blue Vortex fans finished at the back of the pack. But remember how much they were cooling. 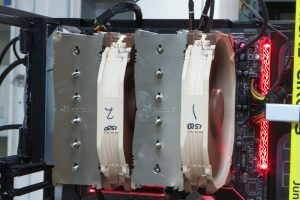 Perhaps there are better fan combinations, but these heatsinks were designed with quiet in mind, and fitting them with more powerful fans does not improve their cooling much. 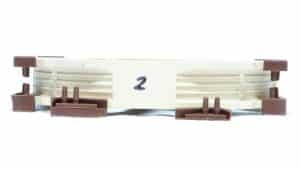 Those extra-thick pads are touted by Noctua as providing “the best balance of performance and acoustics,” as if one is giving up performance to get less noise. I’m not sure about the acoustics, but the thicker pads seem to produce systems that cool very well indeed. One last thought: if you are going to buy a second NF-A15, put the 1500 RPM fan in front and the 1200 RPM fan in the back. 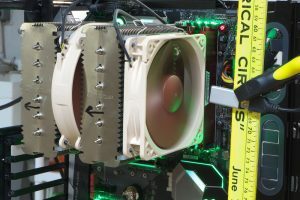 This configuration had a 2.6 °C advantage over the faster fan in the pull position. 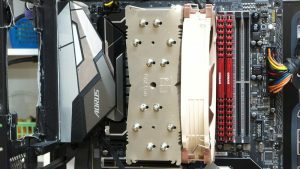 How does the NH-U14S compare with the Hyper 212? Do I need to delid i7 8700k with the NH-U14S to run 5.0GHz? With the NH-D15 can you install and remove memory without removing the heatsink? wingman, data in the article explicitly details what the hardware setup is and the temperatures the NH-U14S kept the system at. NH-D15 compatibility is explicitly reliant on what motherboard and RAM will be used, that sounds like a thread in and of its own for you. As atminside said, the test setup was set forth in the article. I did not delid the i7 8700K. I found I had to drop the cache speed to 4.5 GHz to stay at 5 ghz. But then I am running AVX 2 on that chip. Most people set their OC to x - 1 AVX. I tried Linpack with AVX and it runs cooler than Linpack with AVX2. I think the OC would be the equivlent of 5.2 GHz - 1 AVX. And none of this needs a delidding. Compare the U14S with the 212? The 212 has only four heatpipes. 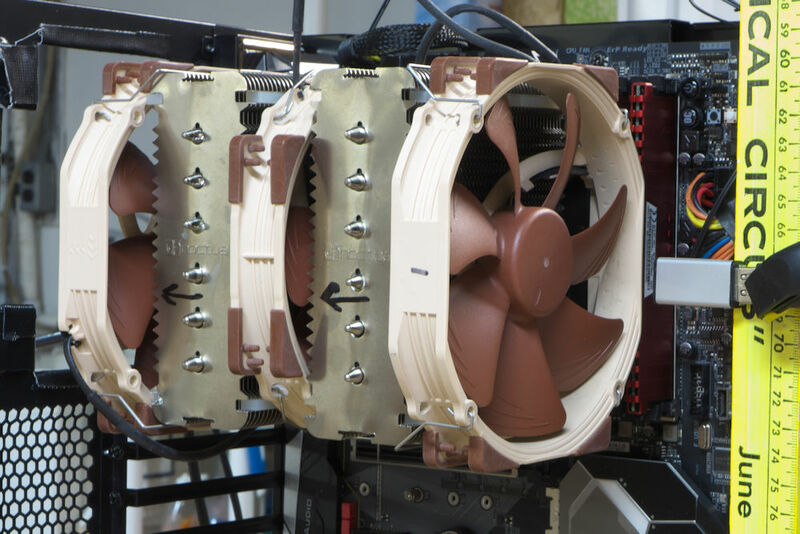 The Noctua has six. Of course a six-heatpipe heatsink will out-cool a four-heatpipe heatsink at these temps. They are not in the same league. I find it interesting that this question became such an issue for you guys considering how many people use the 212. My first thought when I saw this cooler was how it compares to the 212 I currently use. 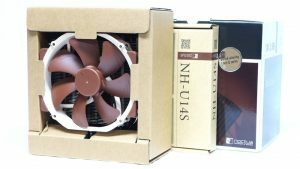 Noctua products generally come at a premium and this is no exception at $65.00 so I think asking how it compares to the 212 is a valid question for nothing else than to justify the extra cost. I hear you about the cost. But all 6-8 heatpipe designs cost this and more, sometimes much more. As a reviewer and because I own two NH-D14's that I bought, I was interested in seeing if the HN-U14S was any better. It was. Mind-blowing. In general, 6-heatpipe designs cool better than four-heatpipe designs because they can carry more heat from the contact plate to the finstack. 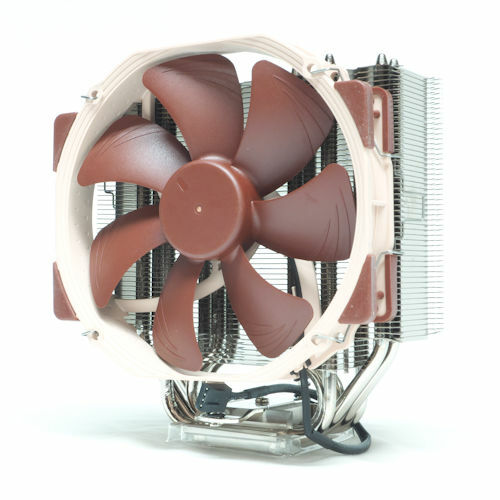 I have had two 90mm Noctua heatsinks in my hands and 120mm heatsinks in addition to the 140mm heatsinks. 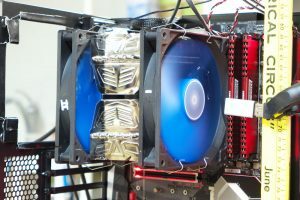 So I have had a lot of experience with their heatsinks as well as the many others I have reviewed (the collection of reviews is here). The Noctua heatsinks have been top performers and use the best construction techniques. I come from a cynical era so I expect a device to show its prowess and not coast on its hype. I have not had the opportunity to review a 212, but I am waiting for CM to send me one. I'm with you on performance better equal the price. That's why I wondered about the performance versus the 212 which is half the price. I would expect it to be a big improvement for that much of a premium. Great review btw. I don't want you to think I'm bashing your review. Just my curious side peaking out. No offense taken. We just couldn't put everything in the review. The results at 4.9 GHz, for example, differ from results at 5 GHz. 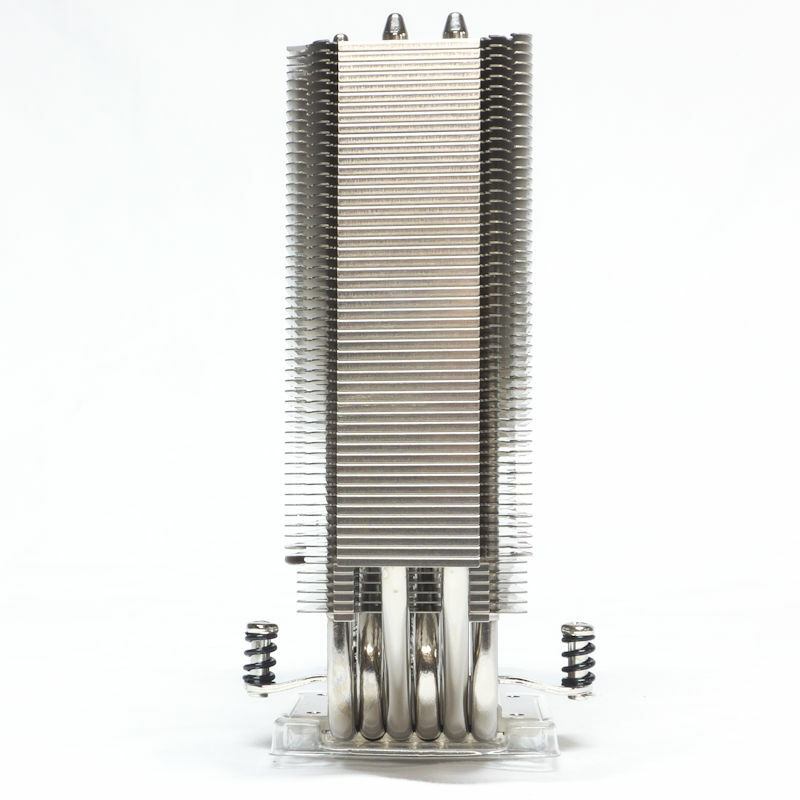 What we published are results at the bleeding edge of what heatsinks can cool. More on that when someone sends me a 4-pipe heatsink. Stay tuned. Do you have LinX 0.6.5 in a windows Zip file that you could post or link to? This is my i5 8600k at 5.0GHz with a hyper 212 and running LinX 0.6.4 at 22c ambient. It does not have hyper thread so I don't know exactly how much more heat the i7 8700k would be running LinX. Well, you are running at 5 GHz, but you are getting only 90-111 GFlops from your OC, which would be low for an i7 8700k. But I don't know about the i5 8600k. You are doing fairly well getting that much GFlops while running such a low max core temp. Running LinX 0.6.5 at 5 GHz with Vcore = 1.37v, I was getting max core temps 92-99c, which is close to the throttling point. My suspicion is that LinX 0.6.4 uses AVX2 on its Linpack, like 0.6.5, but don't hold me to that. Clearly, you were doing something that stole GFlops from your LinX run. As for 0.6.5, try this (http://www.npackd.org/p/org.xtremesystems.LinX/0.6.5 Firefox). Note the link is to npackd.org, but the DL is from GitHub, which is why I would trust it. Good luck. I like what you are doing. I got a error on the link. Yes I was using the PC during the test, it lowered the temperature by 2c. 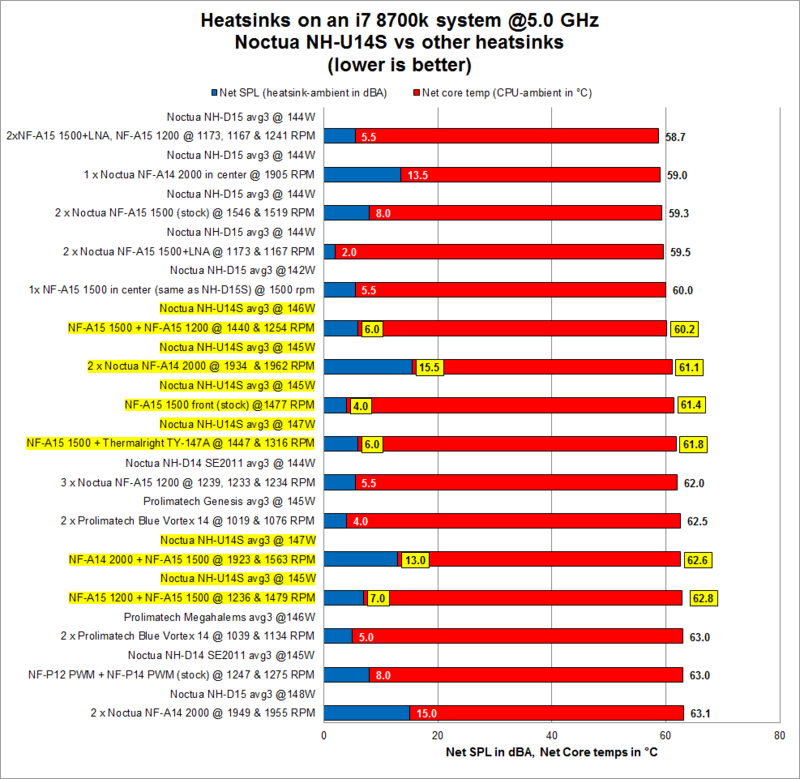 I'm just doing a rough comparison to your review with hyper 212, and i5 8600k. That looks like good cooling with the NH-U14S at 5.0GHz with a vcore of 1.37v. My processor at 5.0GHz runs low Vcore at maximum of 82c, 1.284v Vcore with linX. I use dynamic Vcore, so running 5.0Ghz, Realbench it is a maximum of 90c, 1.308v Vcore. I got a error on the link. . . . That looks like good cooling with the NH-U14S at 5.0GHz with a vcore of 1.37v. My processor at 5.0GHz runs low Vcore at maximum of 82c, 1.284v Vcore with linX. I use dynamic Vcore, so running 5.0Ghz, Realbench it is a maximum of 90c, 1.308v Vcore. You will have to cast about for a good link. I don't know how to package what I have. Your experience with adaptive voltage reflects everybody's experience with adaptive voltage. Your high is fine, but you can see why I went with a fixed voltage before I reached the OC. You will have to websearch to find 0.6.5, I think. A thought: PM me with an email address, preferably with Gmail. I'll see if I can attach and send my copy of LinX-0.6.5.7z. There is one of these coolers on the way to me but TR version. Should arrive this week. Worse is that CPU and mobo will arrive in a week so I will test it in about 2 weeks. From what I can tell the TR version is the same as the mainstream version, but with a different contact arrangment. With the Noctua NH-U14S brackets in place can the 1151 processor be changed? No. For any heatsink, you must remove the heatsink, then open the socket. I know you have to remove the heatsink. The question I'm asking do you have to remove the NH-U14S brackets that holds the heatsink? Ah. I misunderstood. The answer is 'maybe.' You have to try lifting that arm with the bracket in place. Luckily, if the arm will not lift with the bracket in place (I seem to recall this is the case), the bracket is easily removed. It actually works better with the motherboard held vertically. I know this because I do all my testing with a motherboard tray from the be quiet! Dark Base 900 Pro case, so I can move it from horizontal to vertically very easily. The nuts have a Phillips head; so use a magnetic screwdriver to remove them. Then take off the bracket. The spacers are loose, so remove them with your fingers. You may or may not wish to pull off the backplate. Mind the orientation and the screw heads on the socket's backside. You may wish to leave it, but don't be afraid to take it off. I'll pay attention the next time I change mounts. I have done this many times and the Noctua is still the easiest.